Register Log In GliderCENTRAL Forums Housing & Accessories Are fake plants like this safe for gliders? I found these that are silk does anyone know if their ok for gliders even if chewed on? Are plastic ones okay? also curious about these has anyone every tried them? they have on that had fruits and veggies already in it to! but is it healthy? Last edited by sassafras; 04/01/15 12:27 AM. Artificial plants that do not have wire in the stems are safe for gliders. I use really inexpensive plastic vines with leaves and flowers from Michael's crafts for my gliders. These have a plastic chain that is easy for the gliders to climb on. My gliders like to take the silk leaves off and carry them around. I just keep the loose leaves and put them in their toy box. The wooden toys and bridges are probably glider safe but the wood will hold urine and begin to smell in the cage. These are not long term use toys since you will eventually need to throw they out due to the smell. I am not a fan of the ready to serve HPW jar product. It must be used within 10 days of opening the jar so there may be a good bit wasted unless you portion it out as soon as you open the jar and freeze it in ice cube trays. This is a new product available for less than a year so there is no long term observation on how well gliders do when fed this product long term. If you want to feed HPW it is best to go with the Original Recipe using Wombaroo High Protein Supplement or with one of CritterLove's products prepared according to the directions. As far as that Instant HPW or the stuff in the jar goes, we don't even know if they have the Wombaroo High Protein powder in them. I would go with Critterlove Complete if you want a simple staple. It is a great diet and it can be fed with a wide variety of fruits and veggies. There are a lot of good accepted diets out there. They must be fed as written, specially the BML diet. If you click on the word diet, it will take you to the database where you can read up on the different diets. 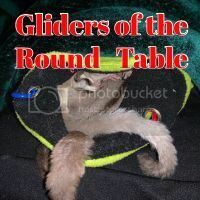 The bottom line on diets is to pick one that you know you can fix, afford to feed and that your gliders love. If your gliders won't eat it, then it isn't a good diet for you.